The Arden Park Youth Triathlon is a community based event put on entirely by volunteers, and supported by local businesses. 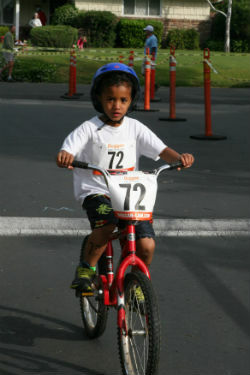 The triathlon uses a traditional swim-bike-run format for youths ages 5-16, which consists of swimming in the Arden Park pool, biking on closed streets within the neighborhood of Arden Park, and running on the grounds of Arden Park. The focus of the event is to provide a triathlon experience for children in a non-competitive and fun atmosphere with distances that are achievable regardless of ability. Kids get some exercise, a huge confidence boost, a chance to try something new (or return to an old favorite), and walk away with a medal around their neck and a huge sense of accomplishment. Youths are tested both physically and mentally, and as their race unfolds you can see the sense of amazement on their parents faces, watching their child accomplish something on their own. By the time the participants cross the finish line, they’re both physically and mentally exhausted…then come the smiles. Their sense of accomplishment and confidence that comes from knowing what they can do if they put their mind to it is amazing. Triathlons are fun to watch and foster a great sense of wellness, and accomplishment. In addition to the triathlon, there is also a free clinic that teaches and helps participants prepare for the event. This event allows kids who wouldn’t normally be exposed to triathlons an opportunity to learn and compete in an event that tests both their mind and body. Watching the event is exciting, and the look on the kids faces as they cross the finish line is priceless. Volunteer: As you can imagine, putting on an event like this requires many volunteers to ensure that the event is safe. Please consider volunteering. You can sign up online, or contact us (ardenparktriathlon@gmail.com) for more information. We are happy to work with students looking to earn community service hours. Sponsor: Of course this event couldn’t happen without the strong support from our Sponsors, neighbors, and volunteers. We are very grateful for the resources that are provided to us, which helps subsidize the cost of the event. One of our goals has been to make this event accessible to as many kids as possible, and with the support of our sponsors, we are able to do just that. If you’re interested, or would like more information about becoming a sponsor of this event, please contact us at ardenparktriathlon@gmail.com. View our Sponsor Letter for details.